At the Scientology VM Tent , originally uploaded by tadnkat. 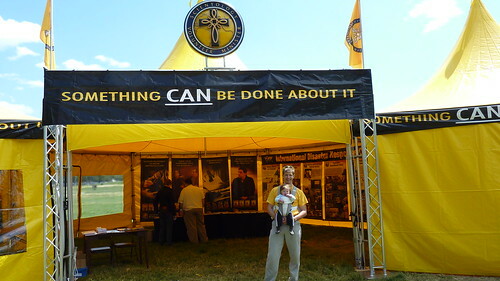 This weekend, Mackenzie & I spent some time helping out at the Scientology Volunteer Ministers tent, down by the Washington Monument in DC. Mackenzie loved helping me tour people through the tent, speaking up with “Da dah dah dah dah! !” while I was explaining the works that the Scientology Disaster Response corps has done in Haiti, etc. People found it very entertaining. Nearly all of the people we toured through the tent were from outside the US – usually way outside the USA. One couple that I toured was from Saudi Arabia, and they were very interested in the translated materials we have available in Arabic. It can sometimes be very difficult for people in Saudi Arabia to get materials that have any kind of religious background different than that of the ruling Islamic state. Another girl that I talked to who contacted me via my website is also from Saudi Arabia, and desperately was trying to get hold of materials from the Scientology Handbook. Her parents were shunning her and preventing her from even leaving the house, due to her interest in what possibly could be another religious belief, so she was having a bit of a rough time. The first piece of Scientology technology which she was able to use was simply using the Affinity-Reality-Communication Triangle. Simply findihg a point where she and her parents agreed (reality) and then communicating about it brought about increased affinity and ability to further bring their varying beliefs to a discussable level of parity. Sometimes the very simplest of things can make all the difference in a person’s life!